The most reliable method for purifying water is to boil it for 5 to 20 minutes. For other convenient methods, you can carry water purification tablets in your backpack or invest in a commercial water filter, which you would use after drawing water from a clean source—ideally clear, flowing water from a natural spring or stream that is not anywhere near manmade structures. 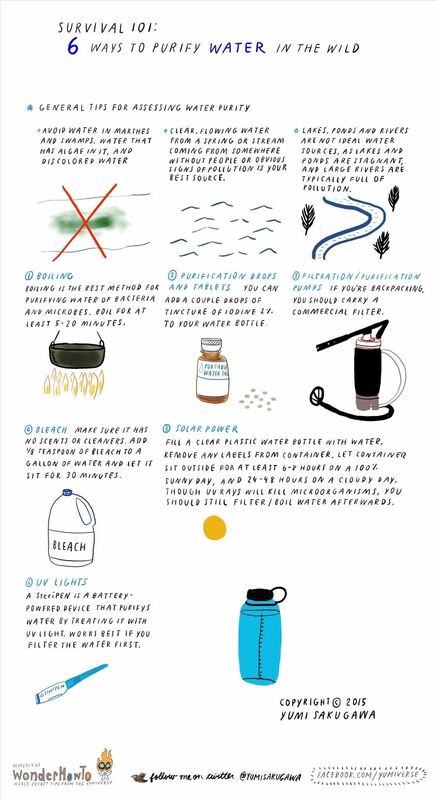 Read below for more methods for purifying water in the wilderness, and general tips for finding the best water source. Click on image to enlarge.